Redland City Council is calling for volunteers for the annual Redlands Coast survey of glossy black-cockatoos (Calyptorhynchus lathami), to be held on Sunday 14 October. Redland City Mayor Karen Williams said the survey was an important part of ongoing efforts to protect one of the rarest and most threatened cockatoos in Australia. 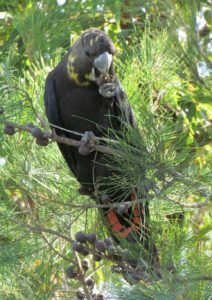 “We are blessed with a naturally wonderful place to live and glossy black-cockatoos, or ‘glossies’, contribute to Redlands Coast biodiversity,” Cr Williams said. “Redland City Council is an active partner of The Glossy Black Conservancy and works with community on planting programs, education and research. “In early September, our annual food-tree planting – this year on Macleay Island – was a great success and saw 600 native she-oak seedlings go into the ground. “This was a wonderful collaborative effort and I’d like to thank community volunteers for this achievement. “The annual survey, to be held on 14 October, is another simple way people can make a meaningful contribution to the preservation of this stunning species. The workshop will be held at Redlands IndigiScapes Centre from 10am to 1pm and volunteers will be assigned their survey area, be able to listen to an informative talk, and hone their bird identification skills. Register attendance at the workshop by contacting IndigiScapes on 3824 8611. Since recordings began at Redlands Coast in 1998, through dedicated volunteers there have been more than 1500 sightings of glossies. Around 98 per cent of these have occurred on the Redlands Coast Southern Islands and North Stradbroke Island. For more information on glossy black-cockatoos visit the IndigiScapes website.